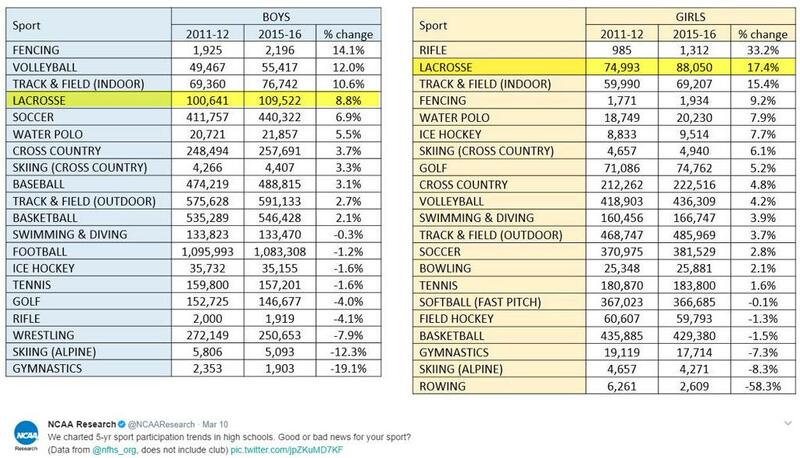 Nearly eight million students currently participate in high school athletics in the United States. 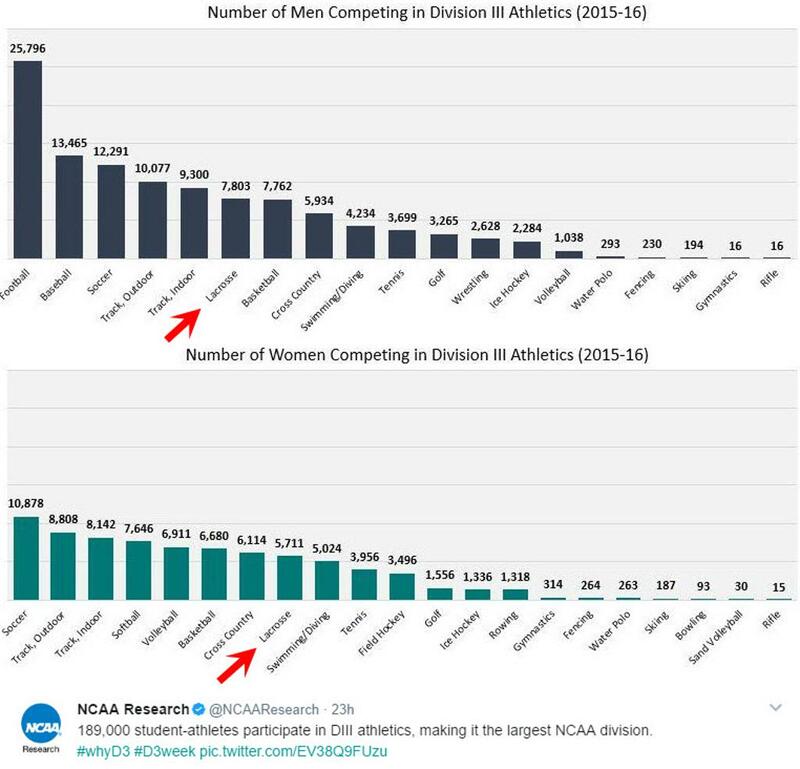 More than 480,000 compete as NCAA athletes, and just a select few within each sport move on to compete at the professional or Olympic level. 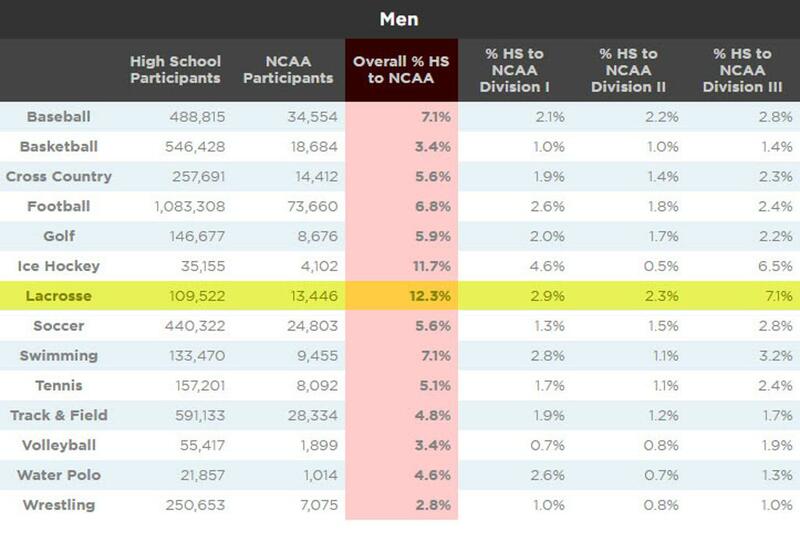 The table shows how many high school and NCAA athletes compete in each sport along with an estimate of the percentage of high school athletes going on to compete in the NCAA. When it comes to fastest-growing sports in the United States, rugby and lacrosse are neck and neck. The good news for the sports tourism industry is there’s healthy competition for attracting athletes. So while youth inactivity remains high—something the recently reintroduced PHIT Act would battle—not all is lost. To help mark the annual Health Through Fitness Day March 22, we look at where sports are headed via stats from the Sports & Fitness Industry Association. 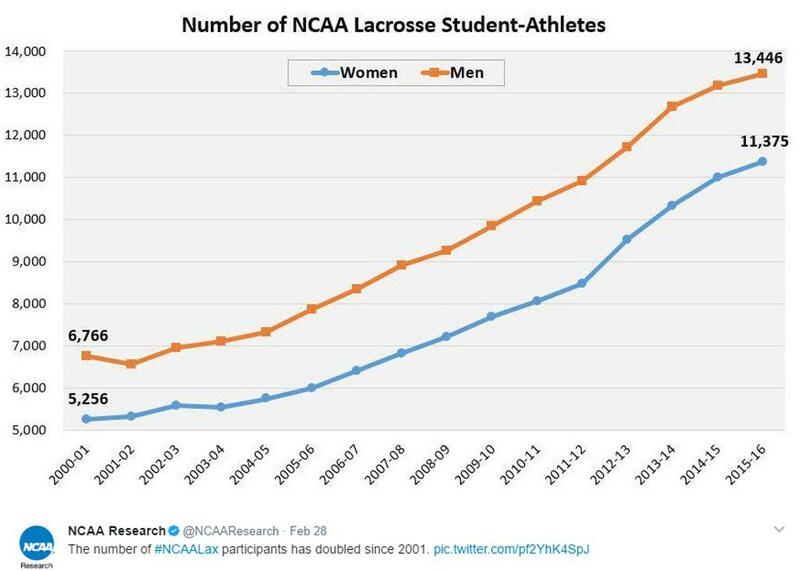 Lacrosse participation grew 47 percent from 2010 to 2015. SFIA President and CEO Tom Cove attributes the growth to the the game expanding beyond the East Coast. Stats bear his theory out: There’s a dramatic rise in youth 6 to 12 years old, young adults 18 to 24 year old and athletes 55 to 64 years old. Rugby has risen 43 percent since 2010, a fact accentuated by its inclusion in the Olympics. “You see rugby moving from what was a private-school thing to being on almost every college campus,” says Cove. Rugby saw the biggest growth of any sport among the 18-to-24 crowd. There’s an 11.2 percent increase among men and a 12.2 percent increase among women, a telling sign that participation will increase. Roller hockey, led particularly by 13- to 17-year-olds, grew 39 percent from 2010 to 2015. Field hockey, fastest growing from ages 35 to 54 and 65 and up, was up 32 percent. There’s an 18 percent increase among women, about 3 percent higher than second-place lacrosse in a gender breakdown. Ice hockey, fueled by an 18 percent increase among Hispanics and a 7.7 percent jump among African-Americans, has witnessed a 19 percent increase since 2010. Cheerleading has reason to, well, cheer, with a 15 percent increase. Interesting, there’s been a 14.2 percent increase among men. 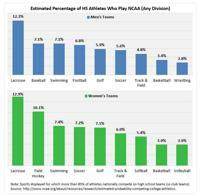 The sport had the biggest jump between athletes ages 25 to 34, edging lacrosse and field hockey.